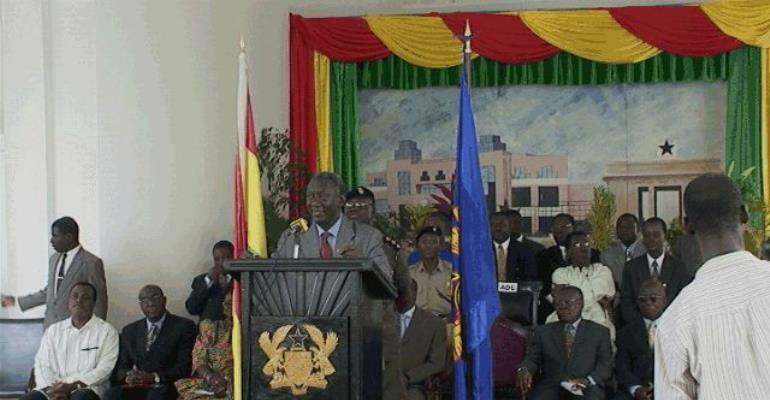 Accra, Feb. 1, GNA - President John Agyekum Kufuor on Tuesday swore into office 29 Ministers made up of 27 men and two women at a brief ceremony at the Castle, Osu. He administered the oaths of allegiance, office, secrecy and presented them with their Instruments of Appointments. The Ministers who had earlier in the day been approved by Parliament were, Mr Joseph Henry Mensah, Senior Minister, Dr Kwame Addo Kufuor, Minister of Defence, Nana Addo-Dankwa Akufo-Addo, Minister of Foreign Affairs, Mr Kwadwo Baah-Wiredu, Minister of Finance and Economic Planning, Mr Daniel Kwaku Botwe, Minister of Information and Mr Hackman Owusu Agyemang, Minister of Works and Housing. Others were, Mr Jake Otanka Obetsebi-Lamptey, Minister of Tourism and Modernisation of the Capital City, Mr Albert Kan-Dapaah, Minister of Communications, Professor Christopher Ameyaw Akumfi, Minister of Ports, Harbours and Railways, Mr Felix Owusu Adjapong, Minister of Parliamentary Affairs and Majority Leader, Major (Rtd) Courage Quarshigah, Minister of Health and Papa Owusu Ankomah, Minister for the Interior. They also included Professor Dominic K. Fobih, Minister of Lands, Forestry and Mines, Mr Ernest Akubour Debrah, Minister of Food and Agriculture (MOFA), Mr Alan Kyeremateng, Minister of Trade and Industry, Mr Kwamena Bartels, Minister for Private Sector Development and President's Special Initiatives (PSIs) and Professor Mike Oquaye, Minister of Energy. The rest were, Mr Ayikoi Otoo, Attorney General and Minister of Justice, Mr Charles Binipong Bintim, Minister of Local Government and Rural Development, Mr Joseph Kofi Adda, Minister of Manpower, Youth and Employment. The two women were, Mrs Gladys Asmah, Minister of Fisheries and Hajia Alima Mahama, Minister for Women and Children's Affairs. Regional Ministers also sworn-in were, Mr Sampson Kweku Boafo, for Ashanti, Nana Kwadwo Seinti for Brong Ahafo, Mr Joseph Boahen Aidoo for Western, Mr Yaw Barimah for Eastern, Mr Boniface Abubakar Saddique for the Northern, Mr Boniface Gambila for the Upper East and Mr Ambrose Dery for the Upper West. Two Ministers of State whose nominations were approved by Parliament but were absent from the swearing-in were, Mr Yaw Osafo-Maafo Minister-designate for Education and Sports who had travelled outside the country and Mr Kofi Dzamesi, Volta Regional Minister-designate. Parliament deferred the approval of three Ministers of State nominated by the President and the Parliamentary Appointments Committee had set up another Committee to investigate some issues on their appointments. They were, Dr Richard Winfred Anane, Minister-designate for Roads and Transport, Sheikh Ibrahim Cudjoe Quaye, Greater Accra Regional Minister-designate and Mr Isaac E. Edumadze, Central Regional Minister-designate. Ms Christine Churcher, nominated for the Ministry of Science and Environment is yet to appear before the Parliamentary Appointments Committee.